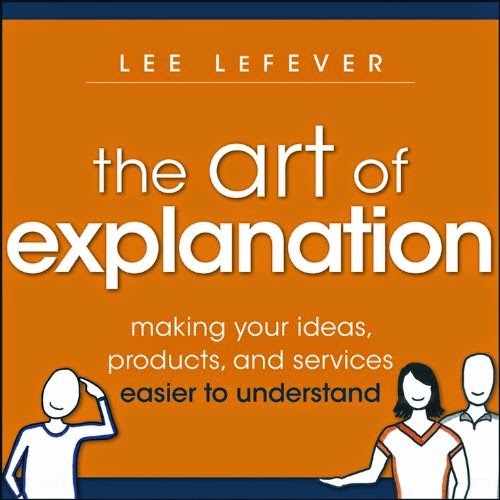 A few months back, I sat down and read The Art of Explanation – Making Your Ideas, Products, and Services Easier to Understand by Lee LeFever. It's a fairly quick read, but chock full of good information about how to explain complex concepts to an audience. LeFever recommends envisioning your topic and audience on an A-to-Z scale where A means the audience knows little or nothing, and Z means they know at least as much as you do about it. Your goal is to move someone from A to Z. Agreement: Set the stage by explaining that you know where the reader is coming from. If you were explaining the "Fastpass" toll-paying device, you'd start by explaining how it's a pain to wait in line at tollbooths, find the exact change, and wait for the gate to go up. Most readers who would care about the device will likely agree with you. That's what you're trying to accomplish at this stage – agreement. Context: Once you've established agreement, you set the context of what you're about to explain. In the Fastpass example, you'd say something about how nice it would be to avoid all the waiting and hassle, and to just pay your tolls once a month and be done with it. Now your audience understands the problem, agrees with you, and sees that you've got a solution coming. Story: Here, you use real-world (or plausible fictional) stories showing how someone experienced a problem that caused them some kind of "pain" (in the literal or figurative sense). Then show how what you're explaining here solved that pain, and how the person is better off now. Stories don't work well for process explanations, or when you have time constraints, or across cultures (in some cases). Connections: There are two ways you can connect the concept you're explaining with something the reader already knows. One is an analogy, saying "It's like fishing". The other connects the old idea to the new one, such as comparing postal mail to email. Here the point is to connect the new topic you're explaining to something similar the audience already understands. In the Fastpass example, you might compare it to a credit card, and compare the toolbooths to the card reader at the checkout. As you go through the Fastpass tollbooth, you're swiping your credit card and paying the toll. This connects something the audience doesn't know (the Fastpass) to something they do (credit cards and card machines). Description: By the time you've gotten the audience to this point, they're ready to learn more about the idea you're there to explain. In the above stages, you're explaining why there is a problem and why the topic you're discussing is a good solution to that problem. Now, you're going to give them the gist of how the solution works. Conclusion: This is basically a short re-cap of all the above stages, to help reinforce the learning in the reader's mind. Ask yourself "What is the 'big idea' I'm trying to convey?" and "What are the key points the audience needs to know about it?" Forget the details and exceptions, and focus on the "big idea"
Who and What? Show portraits or images to let the audience see the person or thing. There's a lot more to the book than I'm covering here. If you've found this brief description useful, you'll probably get a lot more from the actual book.